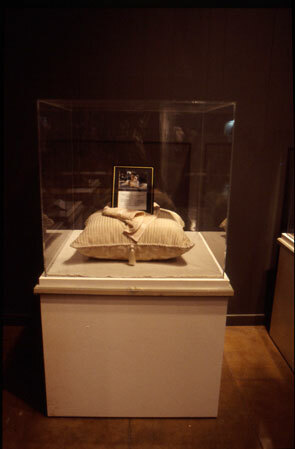 Taxidermied pet lapdog, pillow, towel, carpet in vitrine, 1994. 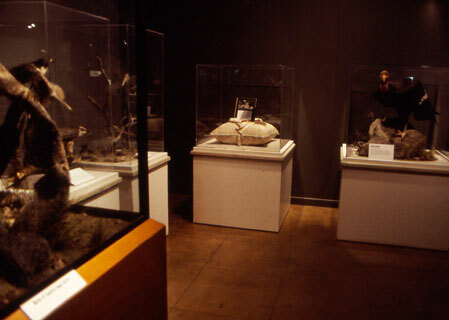 A group of artists were invited to make sited works at the San Diego Museum of Natural History as part of inSITE '94. I kept coming back to the animal dioramas as my primary point of interest, because they seemed so full of paradoxes: the animals were shown "in the natural habitat," but the viewer always came unnaturally close to them; they were made of their real skins, but at the same time, they seemed dead and artificial. To me, pets have always presented interesting questions around the natural and the unnatural, I found myself wondering if people ever preserved domestic animals this way. It turned out that people did, and I found a taxidermist in the San Diego area who sometimes stuffed people's pets. 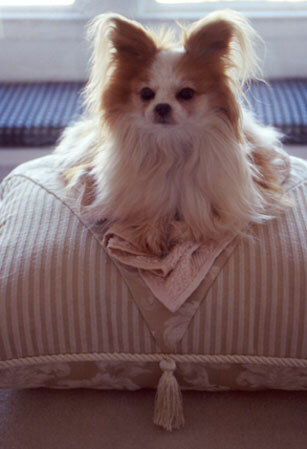 Through her, I arranged to borrow Chloe, a Papillion lap dog, who belonged from an older woman who lived in Palm Springs (Chloe was at the taxidermist's for some cleaning and touch up). 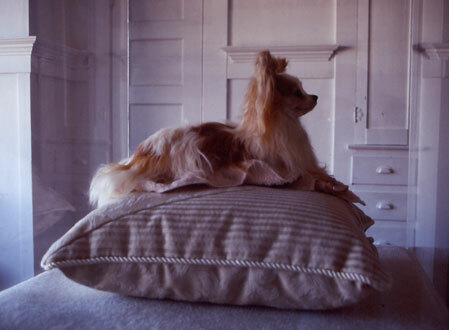 I interviewed Chloe's owner on the phone about Chloe's natural habitat: a house with a cream-colored carpet, a special pillow, and a peach-colored towel that Chloe slept on. 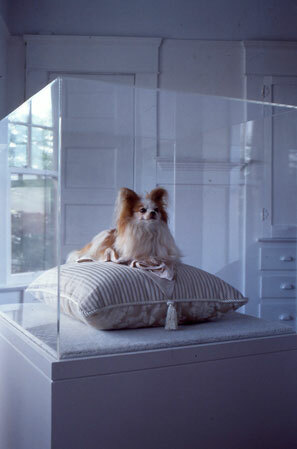 I proposed setting up Chloe in the same manner as the other animals in the Natural History Museum: presented in a vitrine, with signage indicating Latin name, habitat, etc. The museum, however, refused to exhibit the piece, stating that it was offensive, and that people would find the situation confusing and that children might get upset. I pointed out that Chloe was genetically very much like the Coyote who lived in a nearby diorama, and that the Coyote didn't seem to upset or confuse anyone too much, but to no avail. The piece was booted out of the show. I was allowed to place the vitrine in the museum, sans, Chloe, and Chloe was displayed at a local gallery instead with the anecdote of how she came to be there.